Dwarf hamsters have fur coats, but they're not insulative enough that hamsters can tolerate much cold. Keep your hamster in a warm environment indoors; never take her outside when the temperature's not moderate. Keep your hamster warm to maintain her health and comfort. 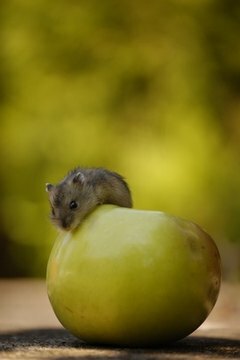 Dwarf hamsters dislike extremes of temperatures, both cold and hot. These critters can die from pneumonia if subjected to too much cold. On the other hand, if your dwarf hamster gets too hot, she may get heatstroke and die. Even in a home environment, your dwarf hamster needs careful temperature regulation. Baby dwarf hamsters are more sensitive to temperature extremes than adults. Ideally, keep a pet dwarf hamster in a stable environment with a temperature around 65 to 80 degrees Fahrenheit. Hamsters can experience more heat and slightly cooler temperatures, but a temperature of 60 degrees Fahrenheit or lower can chill a hamster, making him ill in short time. Place a thermometer on the enclosure to monitor temperature. While you're at it, get a hygrometer to measure humidity. Your hamster's habitat needs humidity around 40 percent to maintain supple skin; add a shallow water basin to the enclosure if humidity is too low. These ranges apply to all dwarf hamsters, including the winter white or Djungarian and other so-called cold-climate hamsters. Even if you keep your home adequately heated, your hamster may be at risk for health problems due simply to cage placement. A cage placed close to a door or drafty window may chill your hamster; too close to a heat source may cause heatstroke. Place the hamster cage on a level surface where your dwarf hamster will not experience a draft or breeze yet cannot overheat. Keep the cage out of direct sunlight, which can overheat the habitat. Signs your hamster has pneumonia include lethargy and trouble breathing. Remember that hamsters are essentially nocturnal, so they tend not to move much in the daytime. If your hamster sits in a hunched position and has an upset look on her face, call your vet to make an appointment. "The Hamster Handbook"; Patricia Pope Bartlett et al. Do Hamsters Prefer Warm or Cold Climates? In What Temperatures Can Hamsters Live? What Are the Signs When Parakeet & Cockatiel Birds Are Too Cold?